Hello all Purdue students！We hope you had a relaxing and enjoyable summer. Are you ready for the exciting start of fall classes? At the beginning of the new semester, GCC (Global China Connection) officers would like to welcome you! Come our callout and join us! 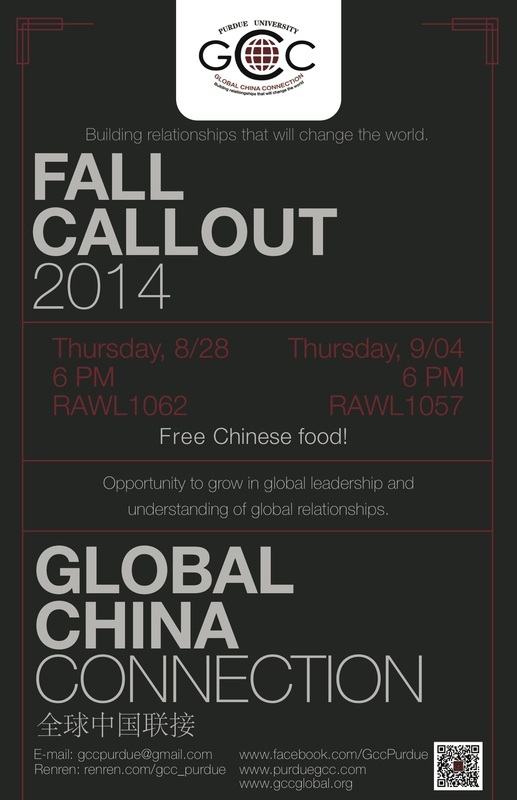 Global China Connection (GCC) is a student-run organization dedicated to fostering deep and trusting personal relationships among Chinese and non-Chinese university students. GCC has over 70 Chapters in prestigious universities around the world. It connects future leaders from all nations and assists them in developing the skills and friendships necessary to succeed both in China and internationally. Global China Connection Purdue Chapter was established in 2009 with hope to promote the welfare of the organization. Our main activities include hosting delegations of university students, providing internship and volunteer opportunities for its members, building alumni social network and hosting conferences annually at Purdue University. Nowadays GCC Purdue Chapter has around 30 officers and serves approximately 500 members at Purdue University. Recent years, GCC not only creates opportunities for Chinese students and their international counterparts to socialize, learn and work together, but also hosts various successful events and educational seminars to bring together GCC members for learning, networking and developing future professional opportunities. Past successful events we hosted or cooperated: Midwest Annual Conference, Chinese Culture Corner, SUBRAU Factory Trip, Fair Oaks Farm Trip, Hot Pot Night, Speed Dating Show, Talent Show, Chinese Spring Feast, etc. GCC Purdue Organization Structure consists of President, Internal vice president, External vice president, Secretary, Treasurer, Treasurer assistant, Development department, Information and publicity department, Programs department and Internal relations department.